This mixer is for artists, business owners, interested sponsors, volunteers and anyone that just wants to get involved. Join the fun! Join the upcoming Venice Art Crawl Mixer on Thursday, November 20, 2014 at 6 – 10 pm. Mix, Connect, and share your ideas. 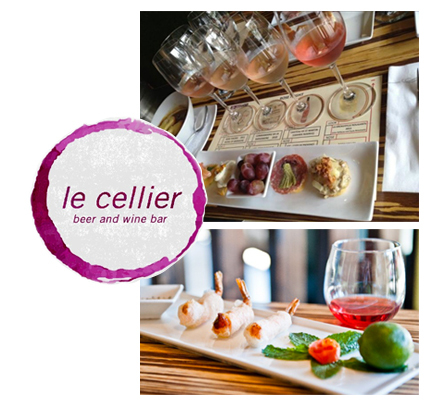 Le Cellier is a new neighborhood Gastro Beer and Wine Bar in Marina del Rey, California, serving estate “Terroir” driven wine and Microbrewery beers paired with contemporary French Vietnamese small bites and platters in a modern chic yet convivial and opened atmosphere. The July Venice Art Crawl Spot Lounge Mixer is brought you by The Terrace. Join the upcoming Venice Art Crawl Mixer on Thursday, July 17, 2014 7 – 10 pm. Mix, mingle share your ideas and inspiration. Welcome to the Terrace Cafe, a full service bar and restaurant steps from the majestic Pacific Ocean. We invite you to enjoy a picturesque sunset on our patio overlooking the ocean or dine al fresco on the charming terrace, for which is our cafe’s namesake. Our extensive Cal-American menu offers something for everyone’s taste including Jake’s Tuna Pokie (seaweed salad with fresh Ahi), Poached Salmon “Odessa style”, Roast Orange Duck, Shrimp Scampi, and Maine Lobster, a wide selection of Omaha Steaks, Cajun Blackened Pork Chops, pizzas, pastas, salads, and we can’t forget to mention the locals’ favorite – Vladimir’s Stroganoff. Join us everyday from 8am till 2am (We’re the only beach spot serving full dinner till 1am). The Terrace is the perfect place for any corporate and personal gatherings, large social events, or the romantic dinner for two under the stars! The Terrace Cafe ~ Come as a stranger, leave as a friend!